In a quiet but major development this past week the FCC brought some much needed relief for the families of inmates in America’s jails and prisons. One of the most vindictive aspects America’s war on crime has been the efforts of government agencies, including prison and jail administrators to profit from the epidemic of mass incarceration. One of the ways of doing this is to contract out the provision of telephone service for inmates to third party phone companies who charge exorbitant rates for local and long distance calls and then kickback a portion of the huge profits they take as a “commission” paid to the sheriffs and wardens of the facilities. Our own Public Service Commissioner Foster Campbell has taken on the fight at the state level with limited success. See, this op-ed piece in The Advocate, and this release from the Capital News posted on Campbell’s Facebook page. Now the Federal Communications Commission has weighed in with a major action to reign in the profiteering on the back of the families of prison inmates. 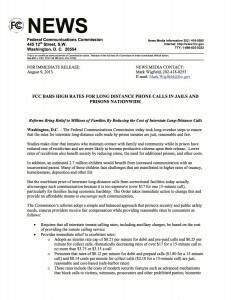 Here is a link to the full text of the FCC Press Release FCC Announcement DOC-322749A1 This is a major victory in the continuing efforts to restore fairness to the correction systems of America.